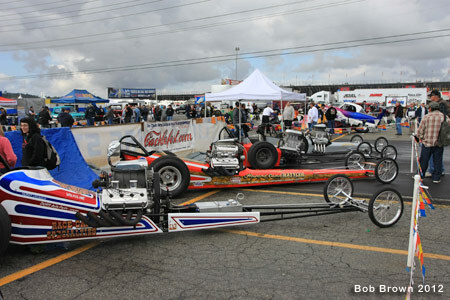 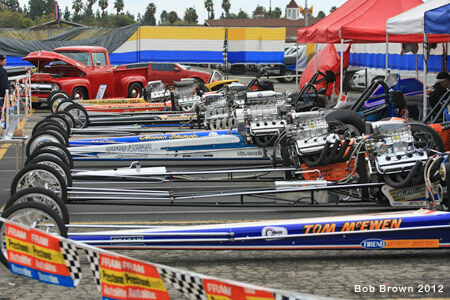 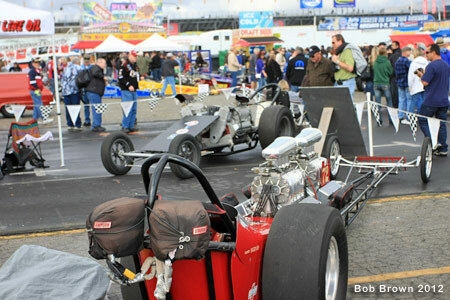 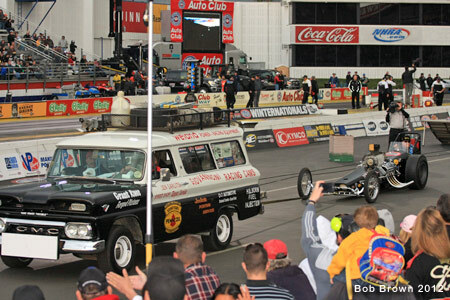 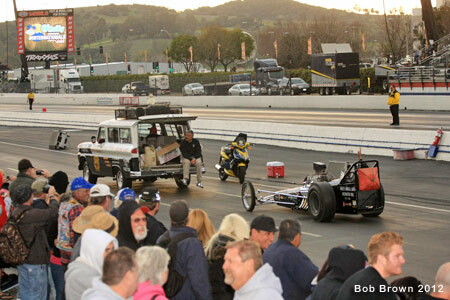 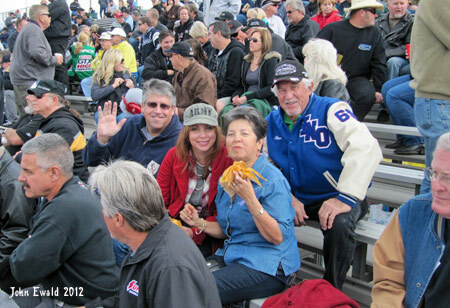 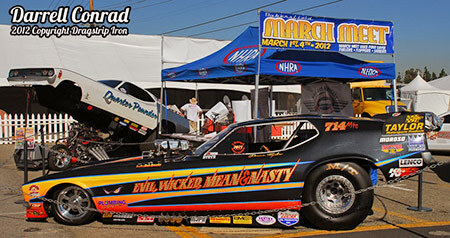 Feb. 09-12 The 2012 NHRA Winternationals lived up to its name in spades. 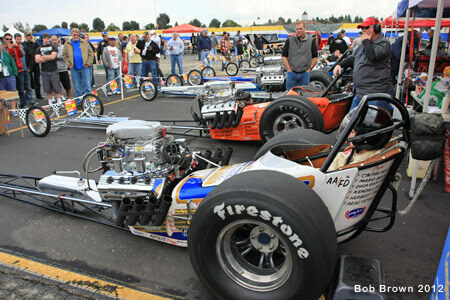 Going in the NHRA thought, with the exception of some sprinkles, safe weather wise for the weekend. 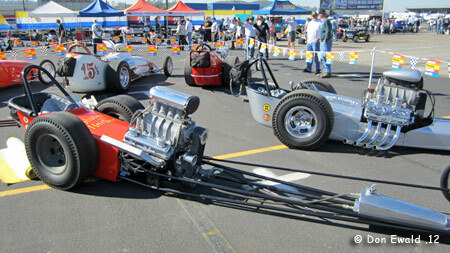 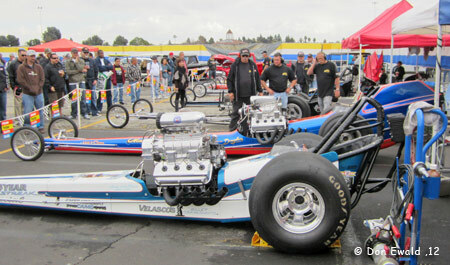 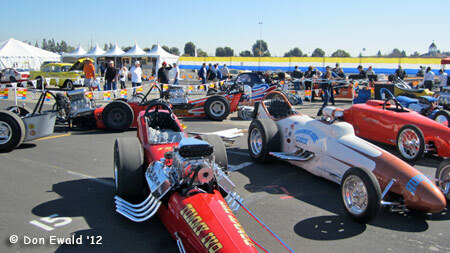 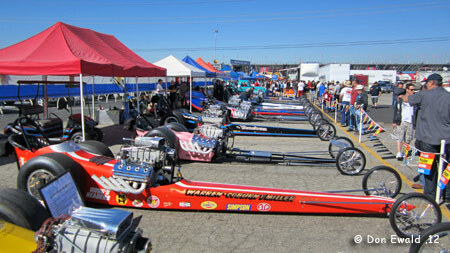 However, this is the WINTERnationals and after a nice sunny Thursday, Friday it went south on Saturday. 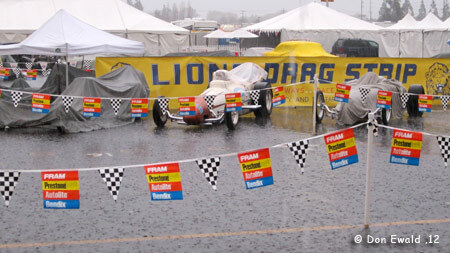 The temps dropped 20 degrees and the second session of pro qualifying was literally washed out by a torrential downpour in the afternoon. 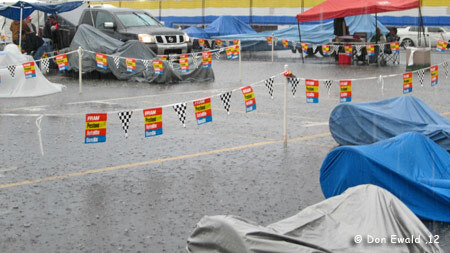 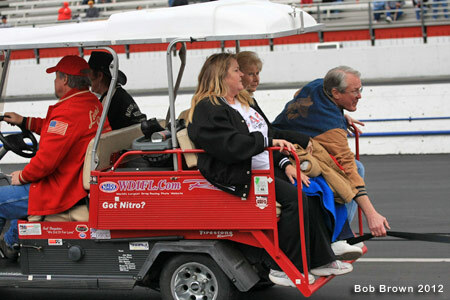 That led to some wet folks who had to attend the Garlits Rat Roast at 5:30. 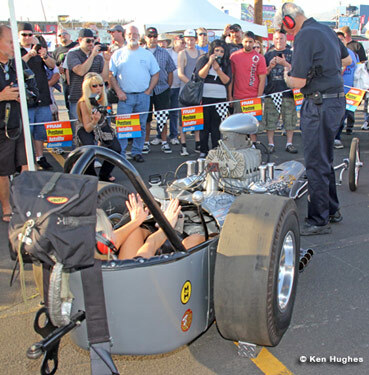 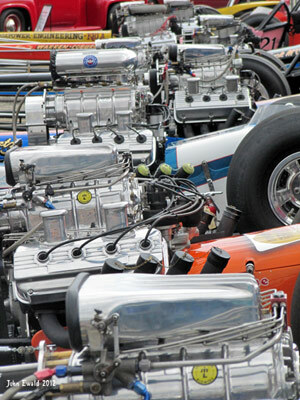 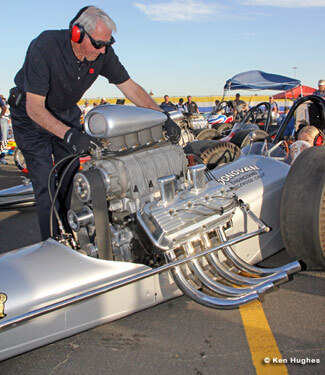 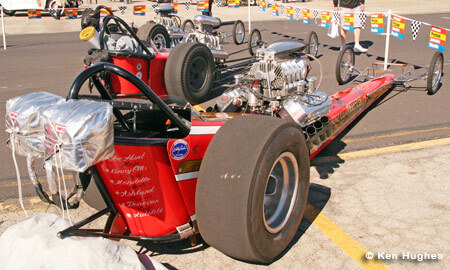 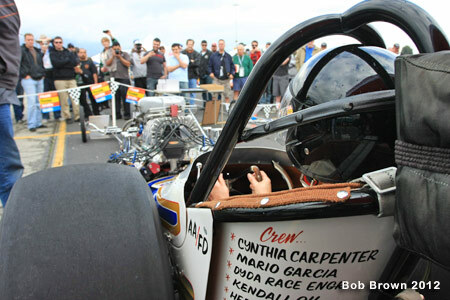 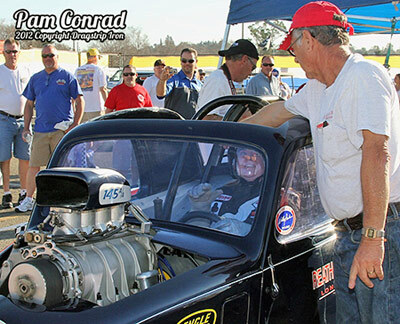 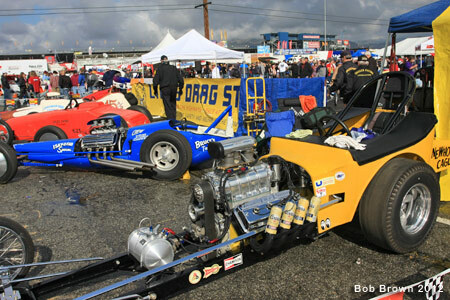 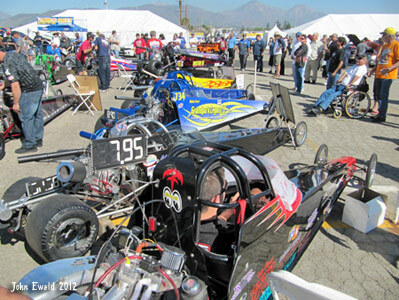 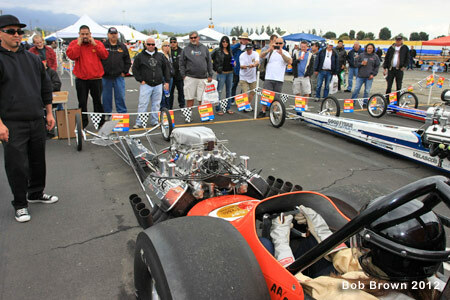 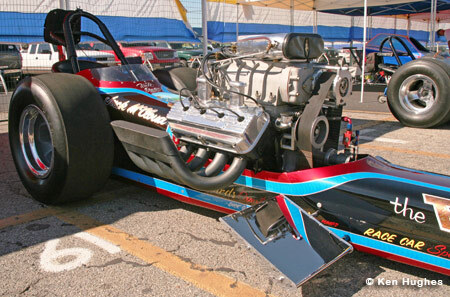 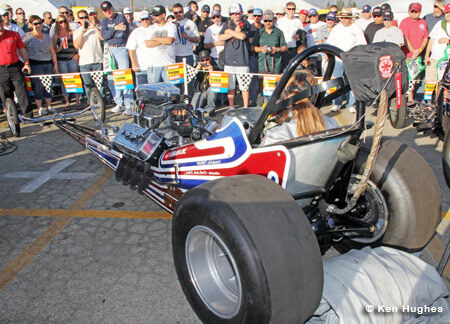 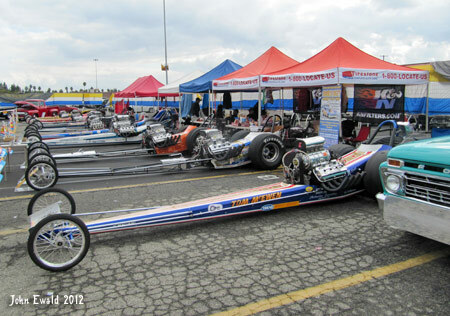 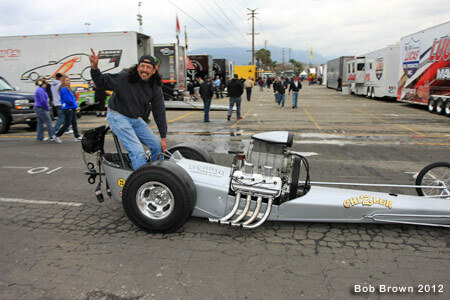 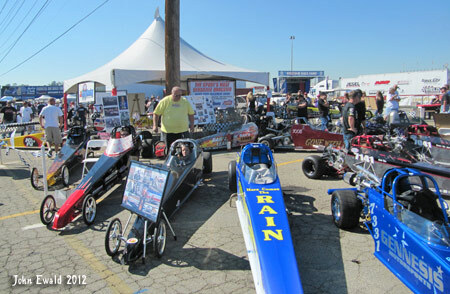 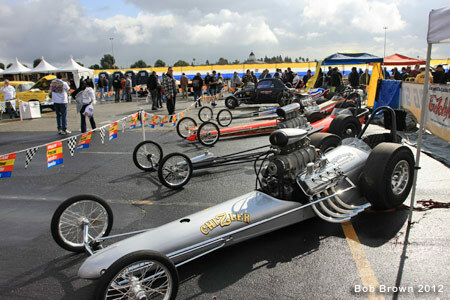 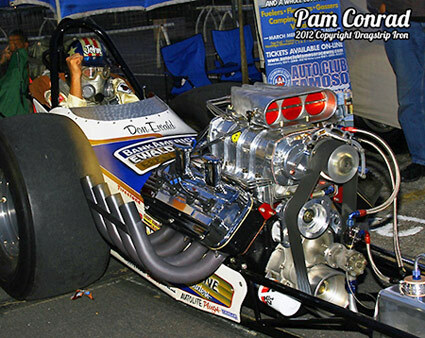 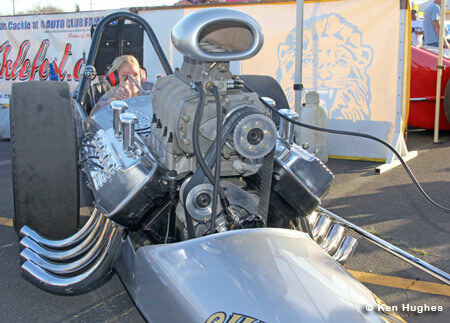 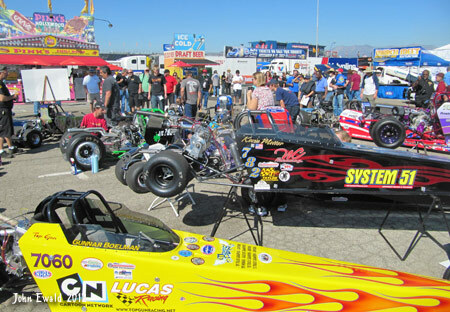 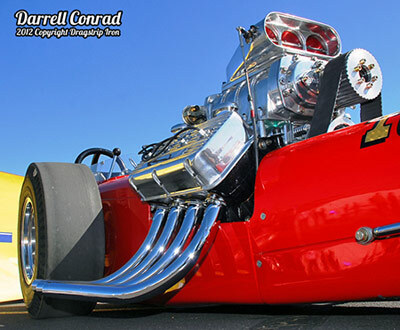 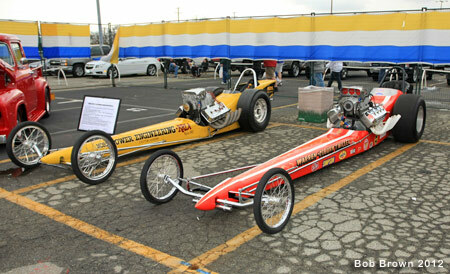 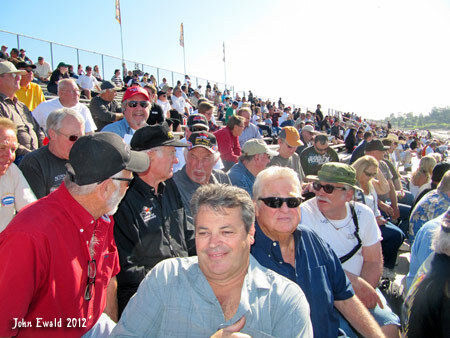 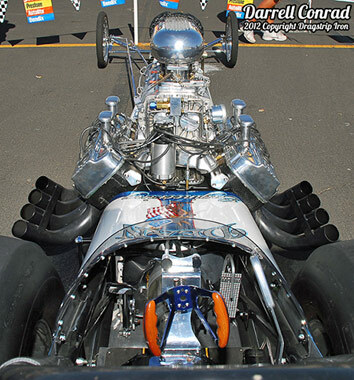 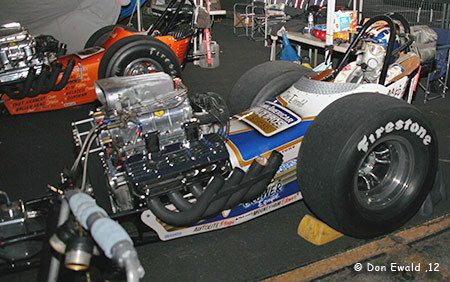 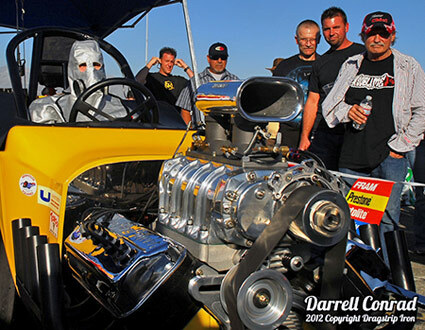 The Golden 50 Corral once again featured about 30 cacklecars and other historical hot rods but shared the glory with the NHRA honoring the 20th Anniversary of Jr. Dragster. 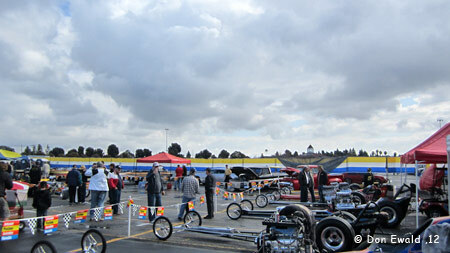 They were out in force with about 20 of the first step many of our next generations take into drag racing. 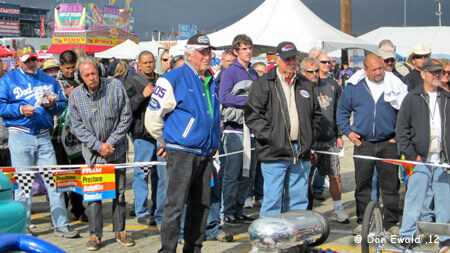 Here are some shots taken over the weekend of the corral and those who graced it for the first event of 2011. 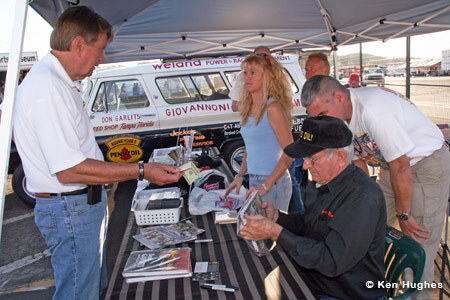 Don Garlits was on hand to sign autographs and represent the Project 1320 and to attend his own "Rat Roast" Saturday night. 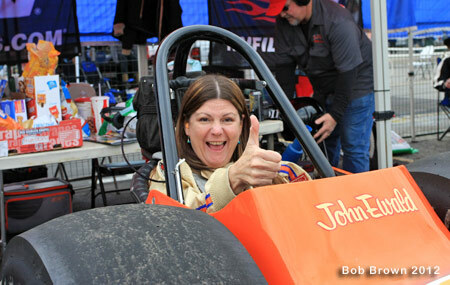 Project 1320 founder Traci Hrudka was at the booth as well. 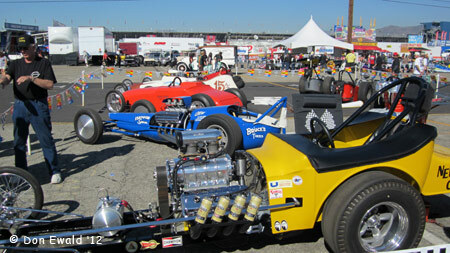 Ron Johnson had his entire fleet on the grounds. 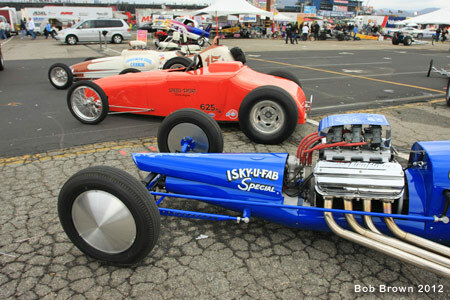 The Tommy Ivo "Barnstormer", the Karamesines "ChiZler" and the Shubert and Herbert SBC car. 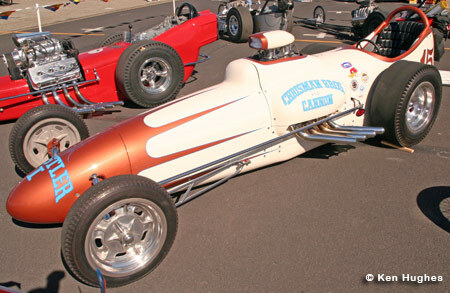 Gruzens Newhouse/Cagle AA/FMC, Ray Lake's "Cook & Bedwell", Red Greth's Speed Sport roadster and Art Chrisman's Hustler I.
Mike Kuhl and Tommy Allen brought their Tom McEwen "Tirend" car which is for sale. 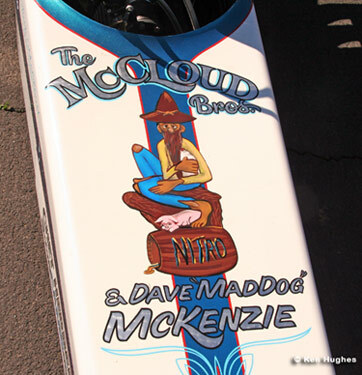 McCloud Bros. Dean Engineering Spec. 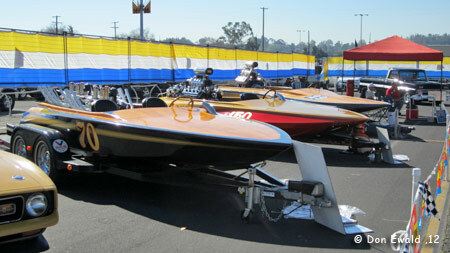 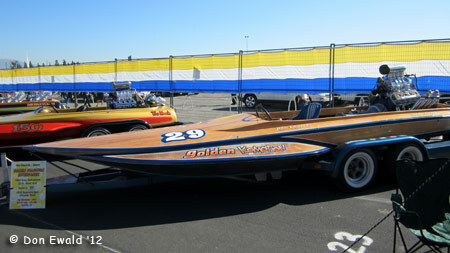 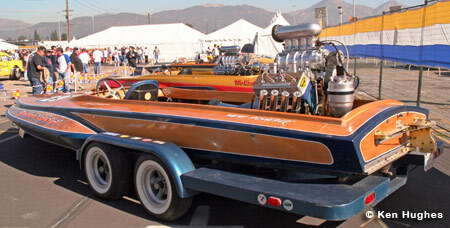 Don Edwards with Barry McCown and Bob Silva were out with their vintage drag boats which almost came into action on Saturday afternoon. 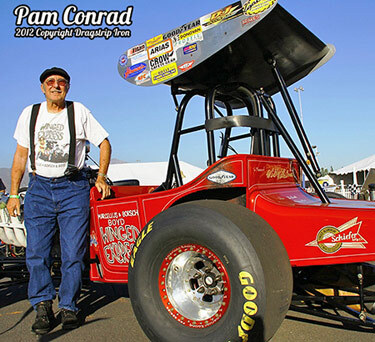 Ron Sterns had his Ratican-Jackson-Stearns A/FA, the now painted Eric Bowman restored RCS Funny Digger and out of the museum, the Howard Cams Rattler. 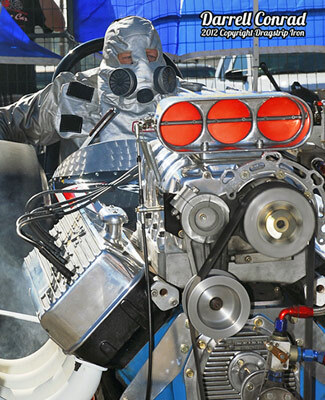 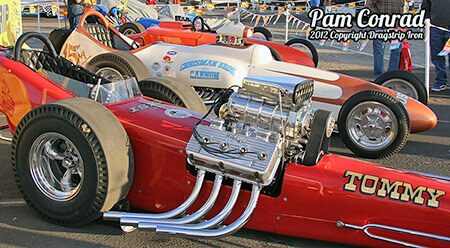 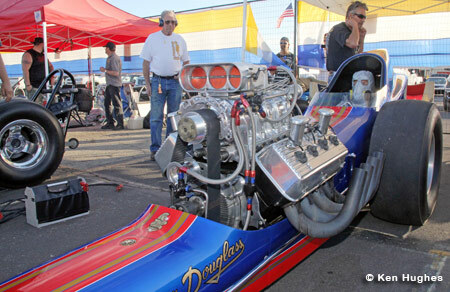 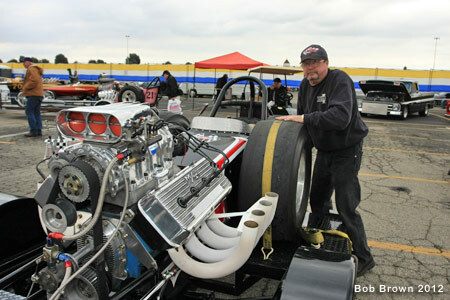 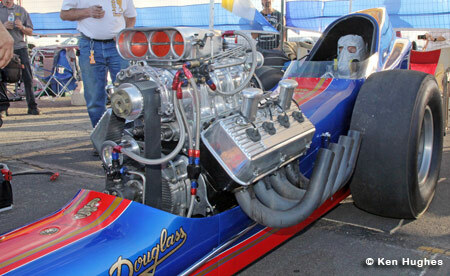 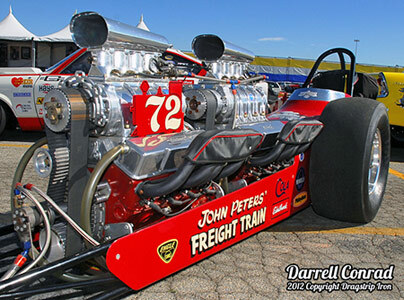 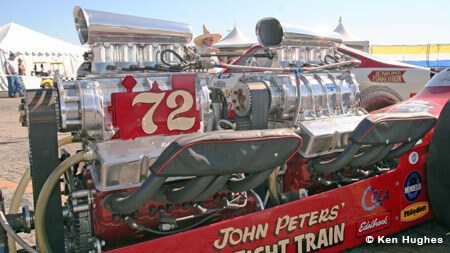 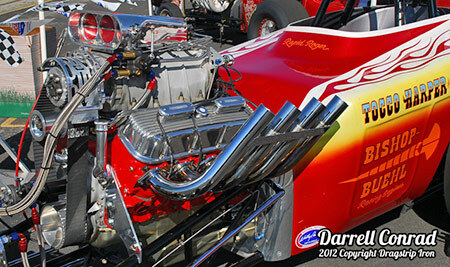 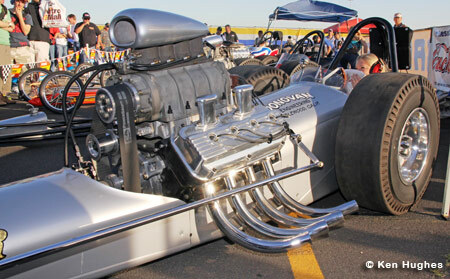 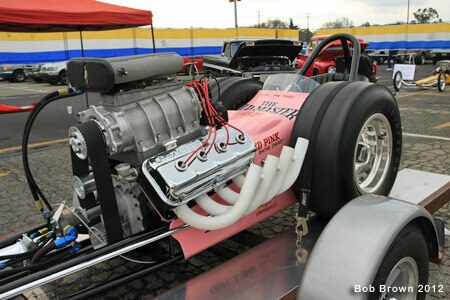 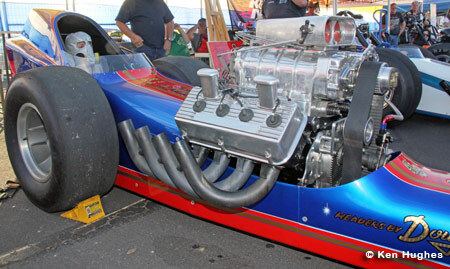 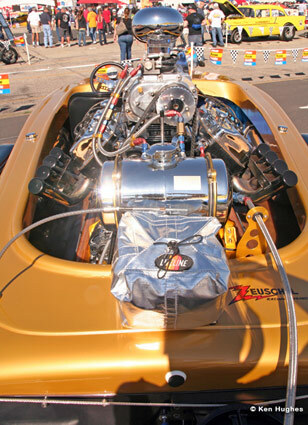 Doug Robinson's "Horsepower Eng. 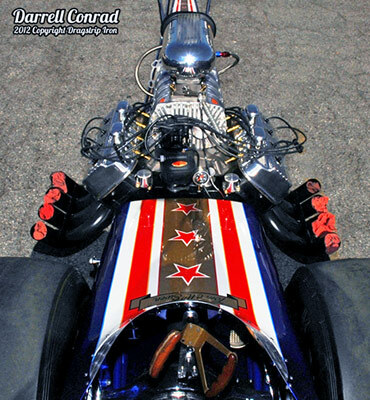 ", Warren, Coburn & Miller, Pete Eastwood's "Old Master" and Paul Schavrien's "the Poachers". 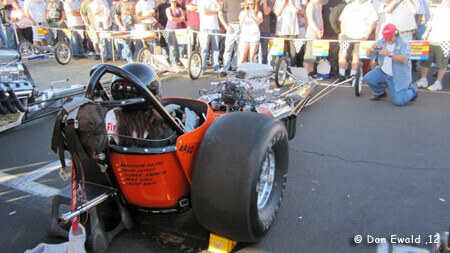 The RCS Funny Digger with Gwen McWilliams in the seat drew a crowd. 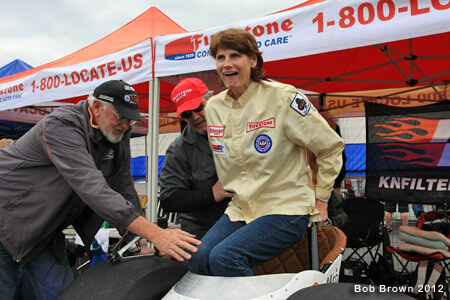 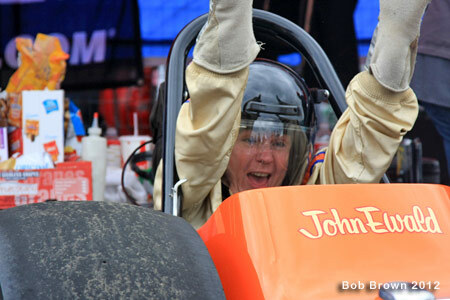 The first fire-up of the Mastercar found Paula Karamesines-Baldwin in the seat. 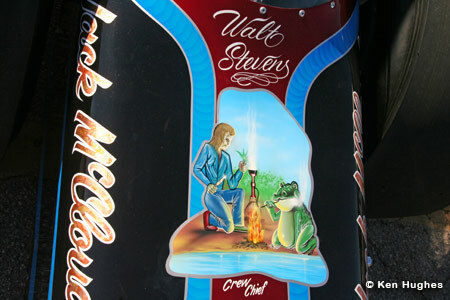 Gwen McWilliams LOVES to do fireups and this was one of many she got over the weekend. 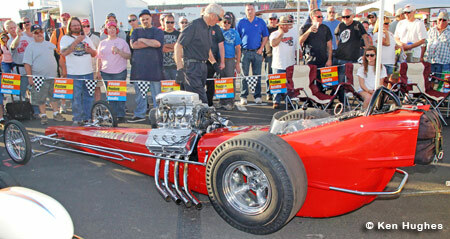 Bob Hansen's Wynns Spoiler. 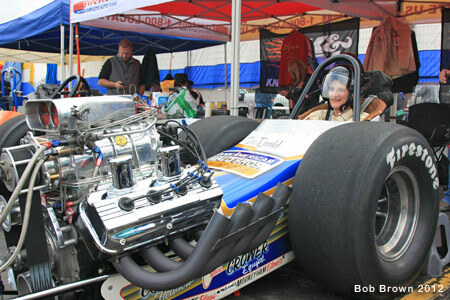 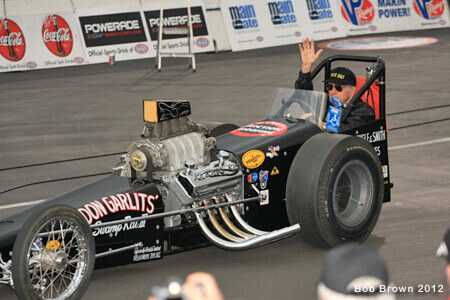 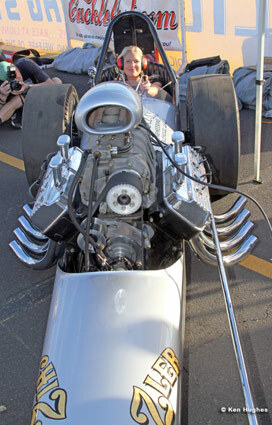 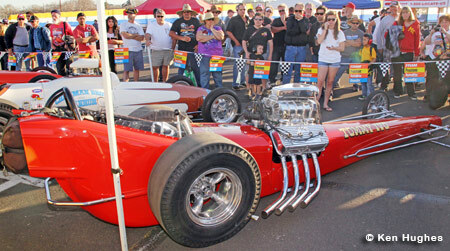 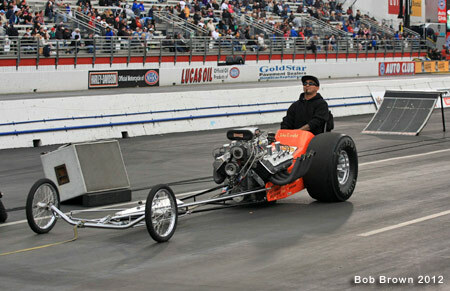 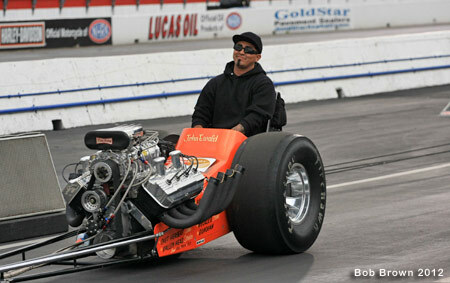 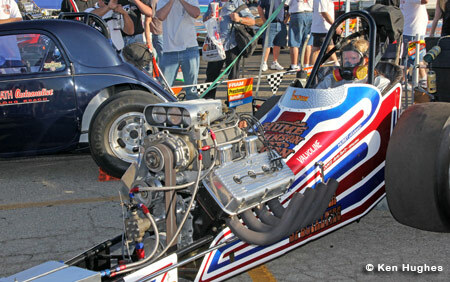 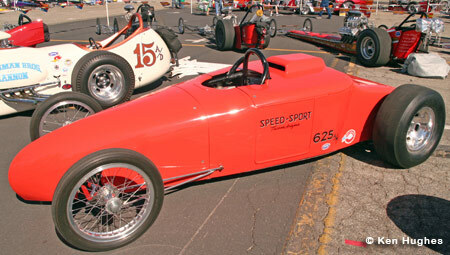 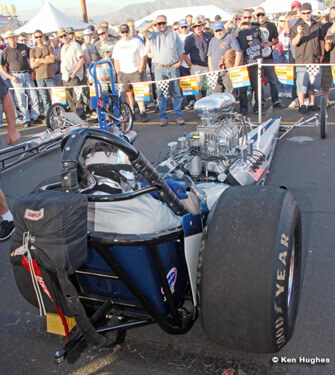 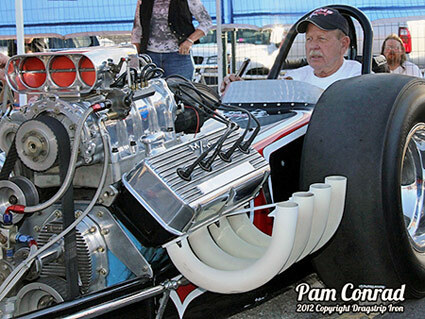 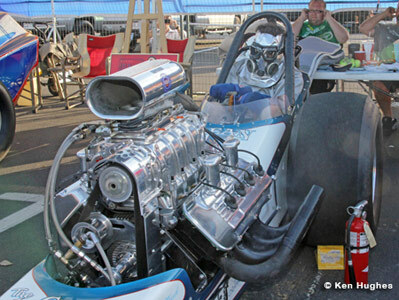 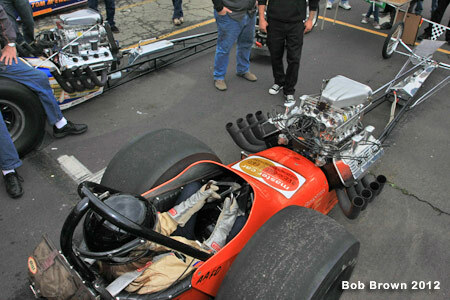 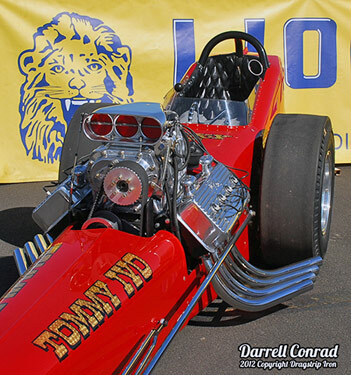 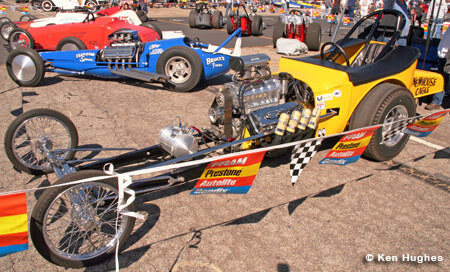 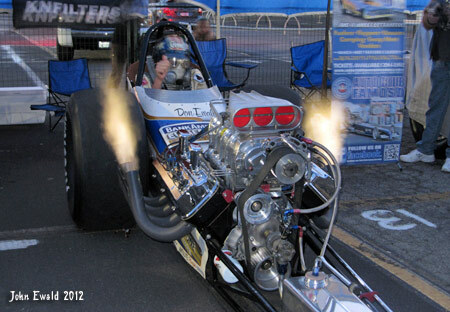 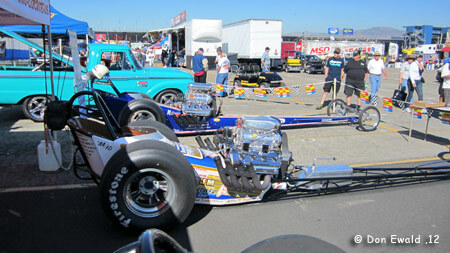 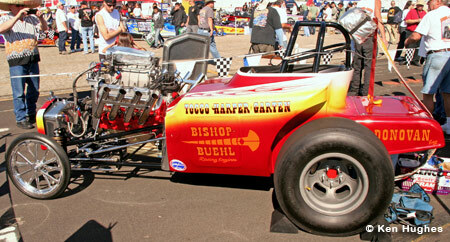 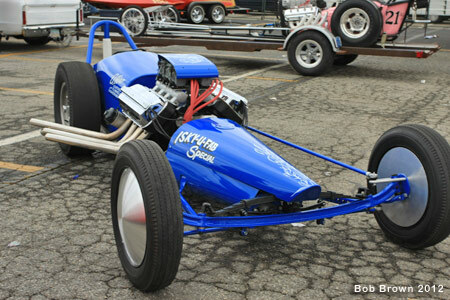 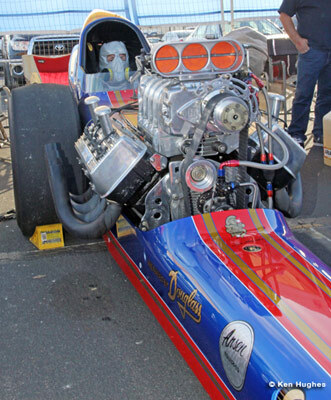 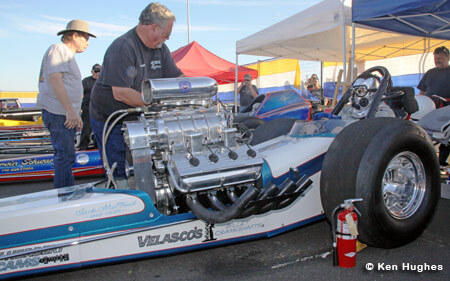 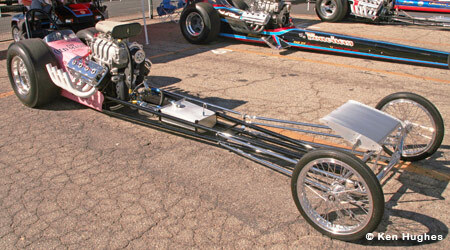 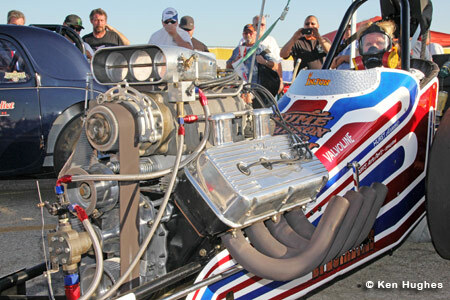 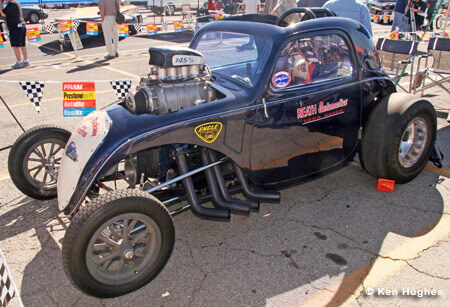 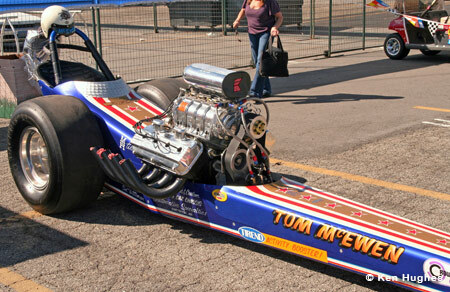 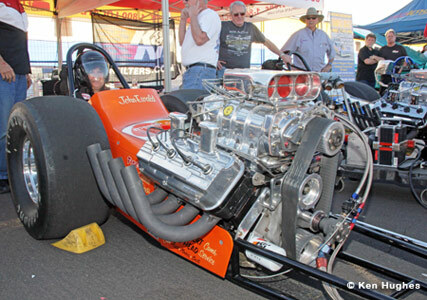 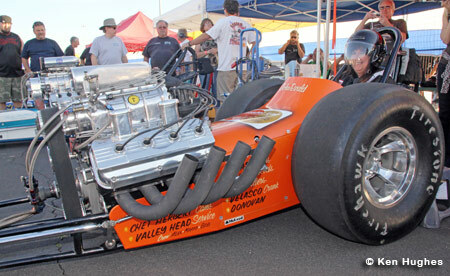 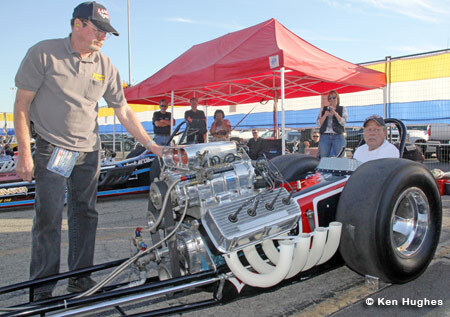 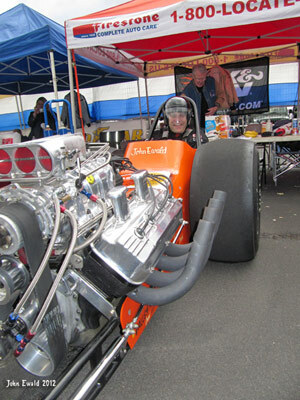 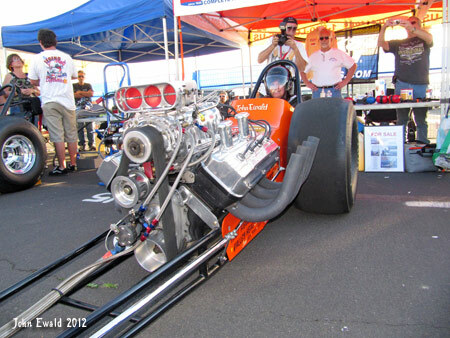 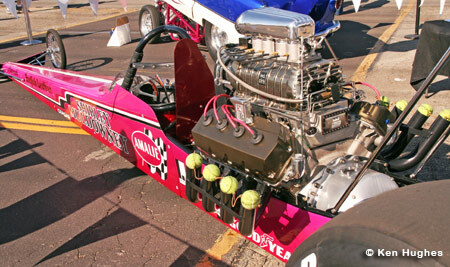 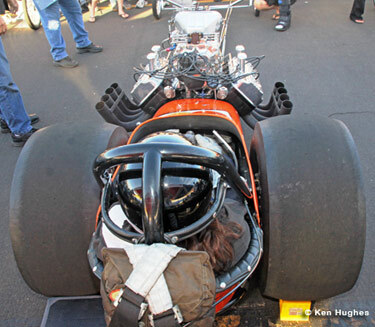 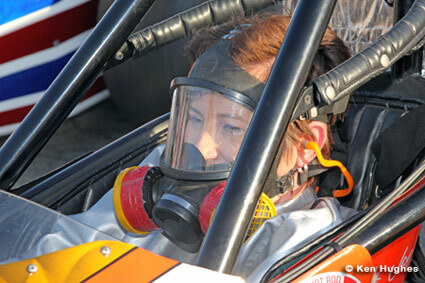 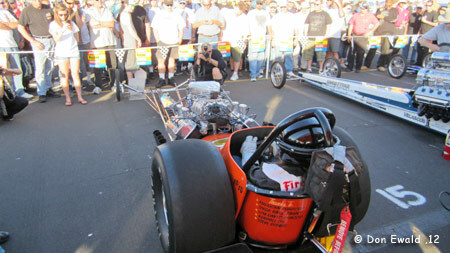 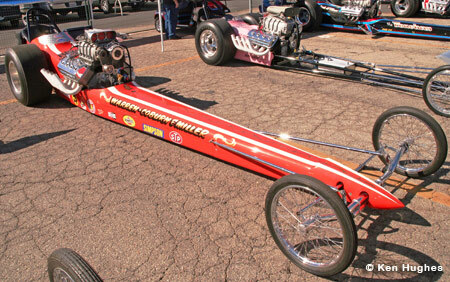 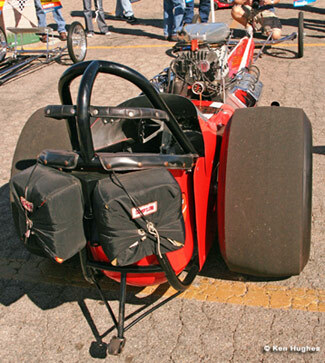 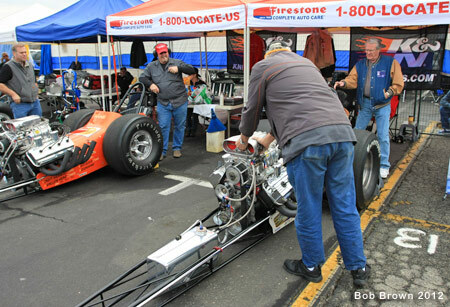 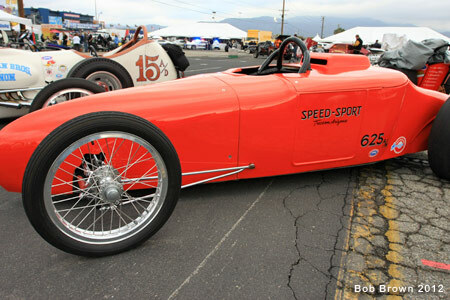 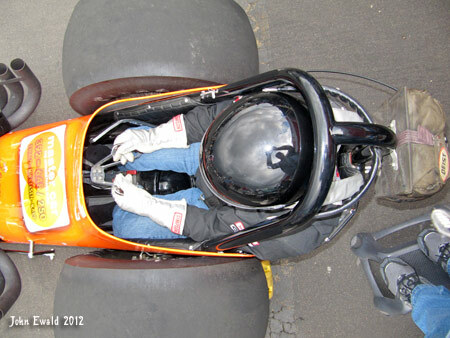 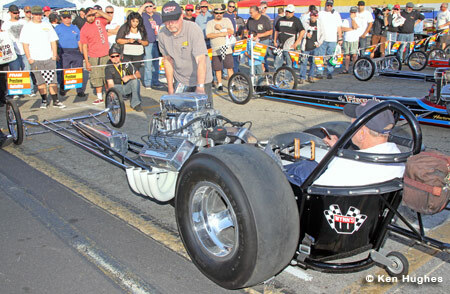 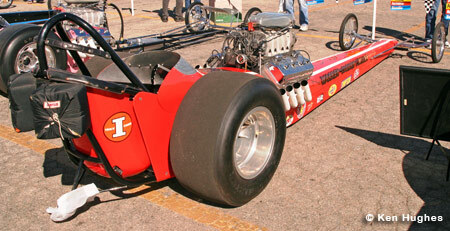 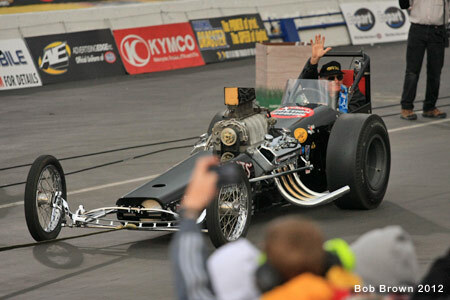 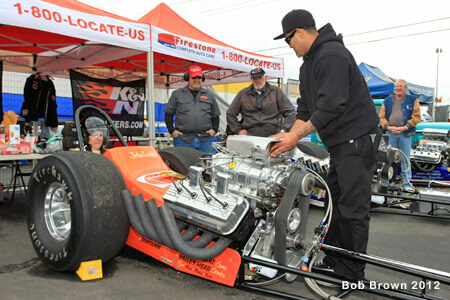 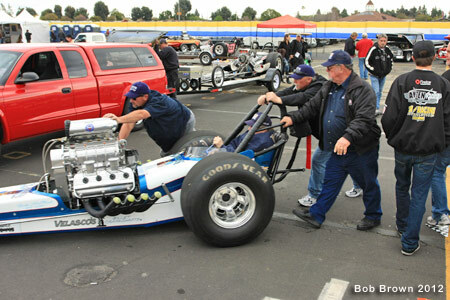 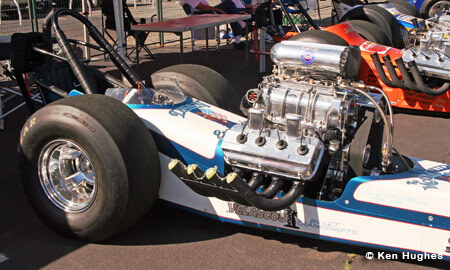 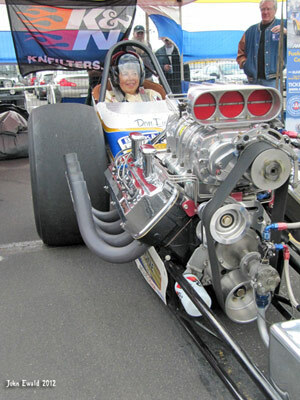 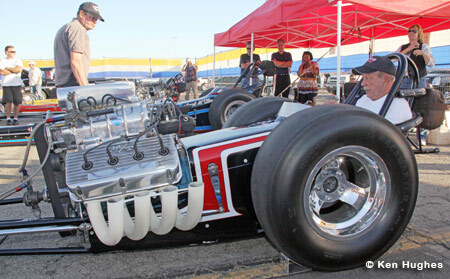 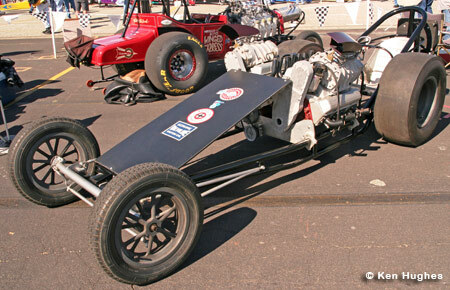 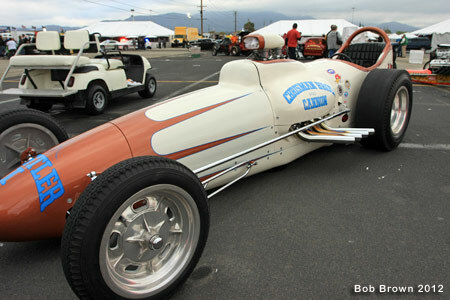 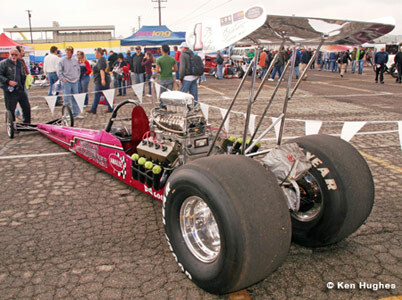 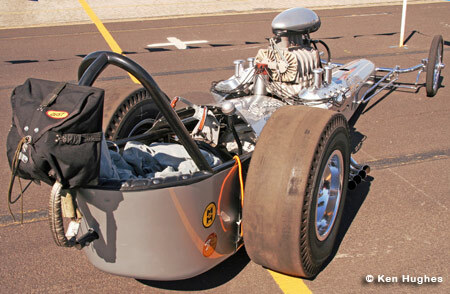 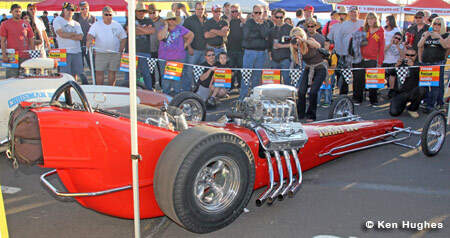 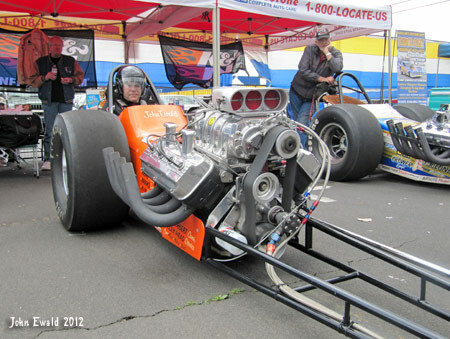 Robin Millar got the seat of Ron Sterns' fuel altered on Friday. 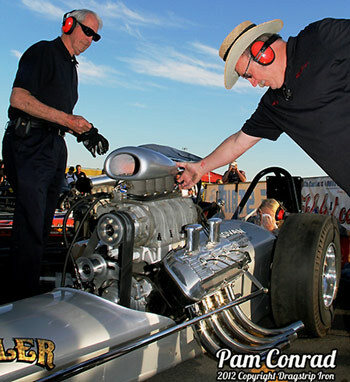 The enduring Howard Cams Rattler on Friday. 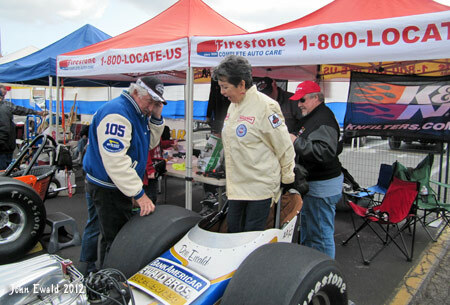 Dennis Taylor's NFC was on hand to promote the 2012 March Meet. 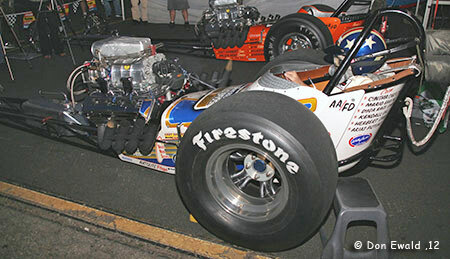 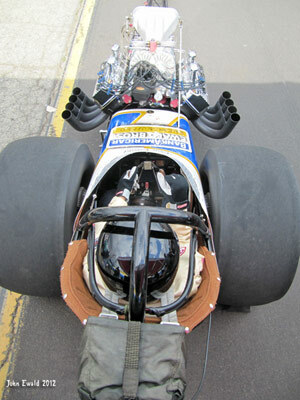 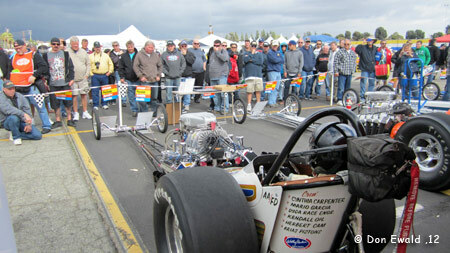 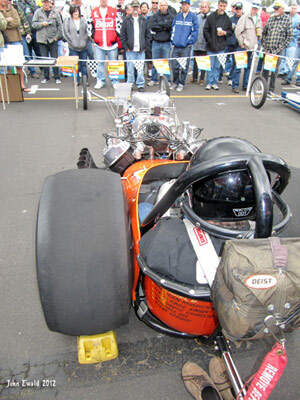 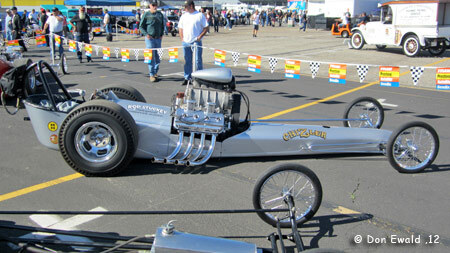 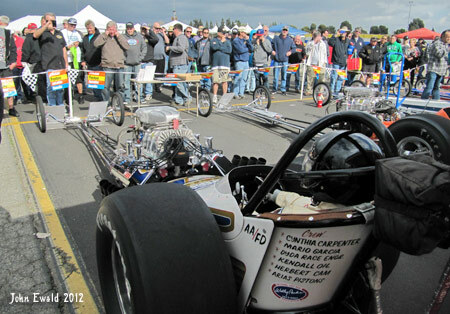 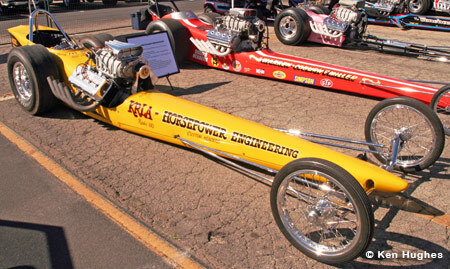 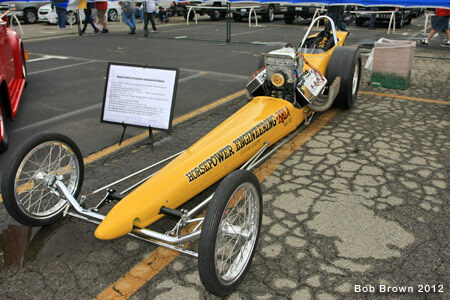 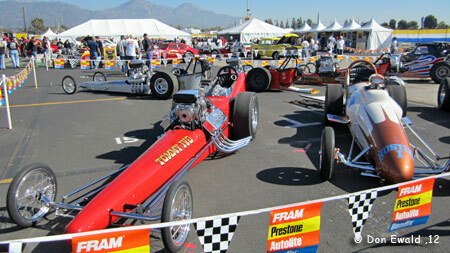 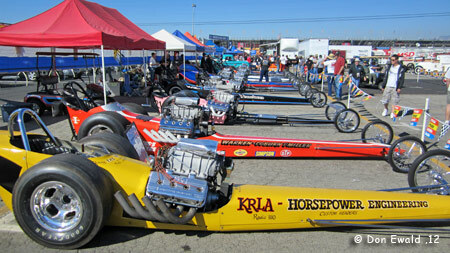 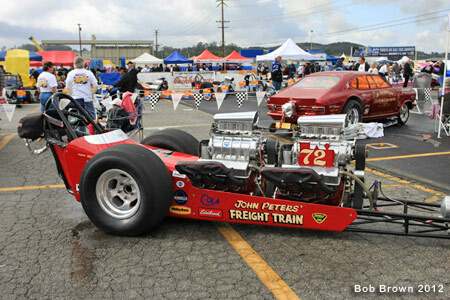 The Jr. Dragster display drew a lot of fan interest. 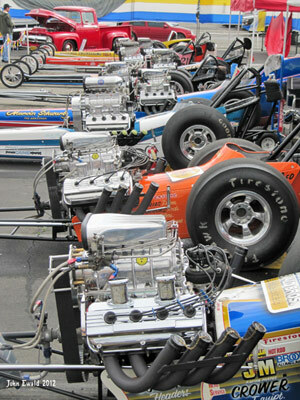 This is drag racing 101 where hopefully many of our future stars will come from. 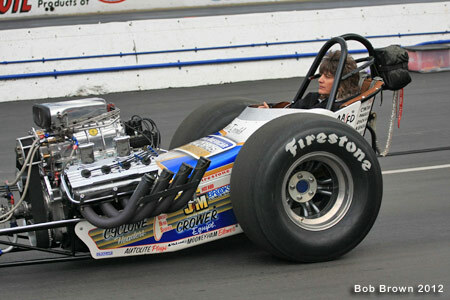 Gwen in the Gruzen family Cagle roadster. 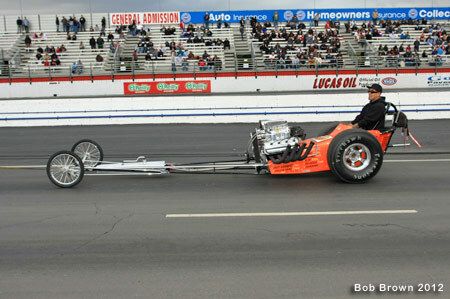 Bill Schilling in the Wynn's Spoiler. 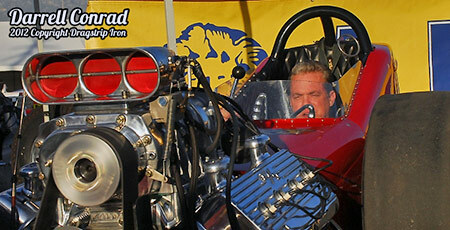 McEwen Tirend car with Mike Kuhl working the injector. 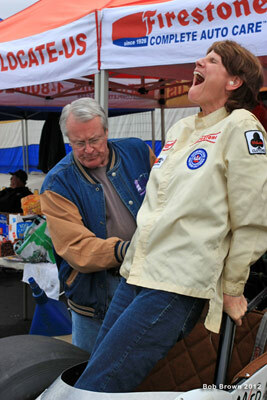 Ron Johnson gave Shasta Brock something to cry about in the ChiZler. 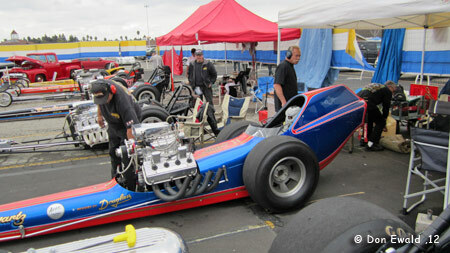 Tim Finley, who was the Greeks crew chief up until about a year ago got a seat in the Barnstormer. 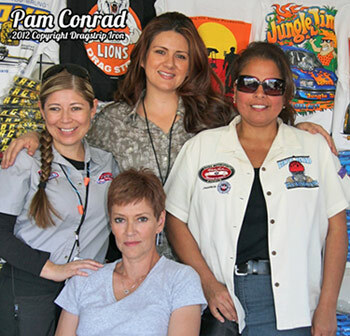 The NHRA Motorsports Museum (just a half mile away) was well represented by Graciela Sanchez, Monique Valadez, Rose (Rosebud) Pohorley and Kat Lotz. 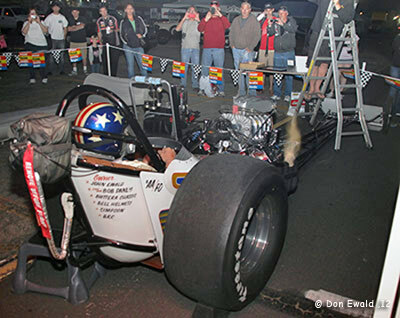 The only fire up after dark was WDIFL photograper Ken Hughes in the BankAmericar. 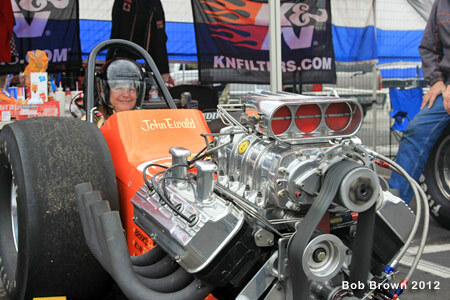 Ken was a cackle virgin and wanted the whole deat, firesuit and flames. 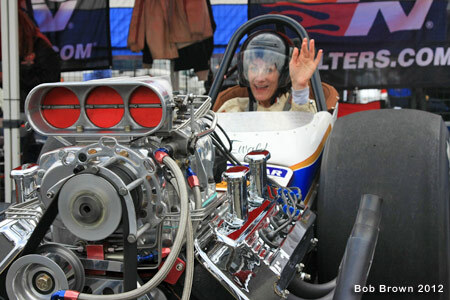 Saturday found Gloria "Gordy" Gibbs firing up the BankAmericar. 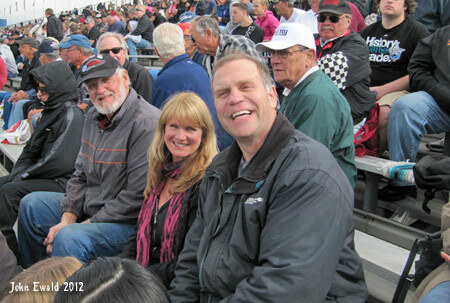 Husband Steve, Bob Danly and John get her in. 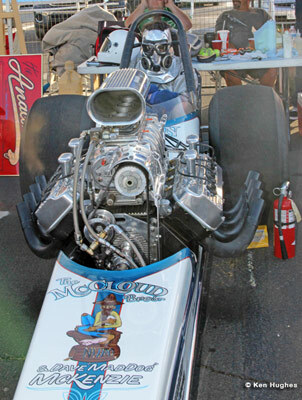 The McCloud Bros. did more than one fireup over the weekend. 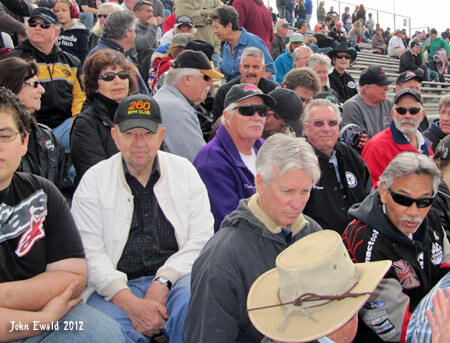 There was no shortage of old racers in the 24/24 stands. 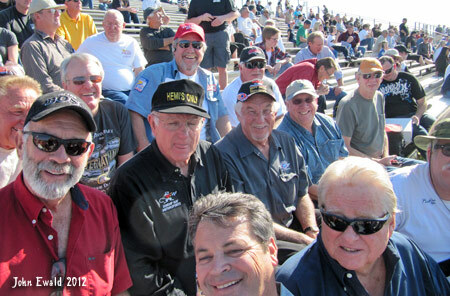 Jerry Ruth, Sonny Messner, Don Ewald, Don Garlits, Donny Couch, Bill Doner, Steve Gibbs, John Ewald and Marvin Graham. 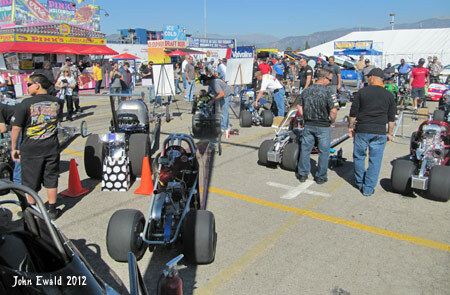 This is the hang-out at the 800' mark for the old dogs during pro quaifying. 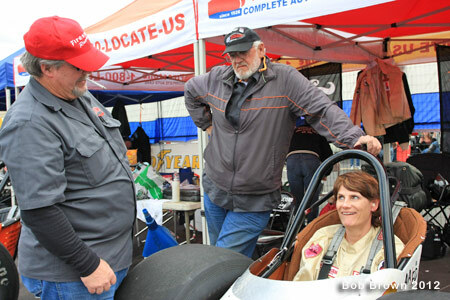 Paula Karamesines-Baldwin and Lee Buttera- Capps in their usual spots. 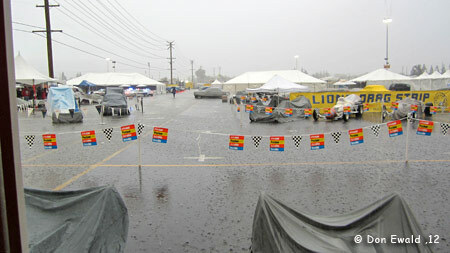 About 3 PM Saturday afternoon the cold clouds turned into driving rain. 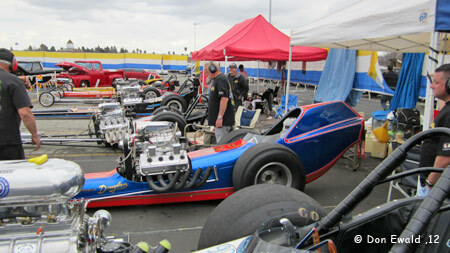 Sunday everyone was back to 24/24 for the first round of nitro. 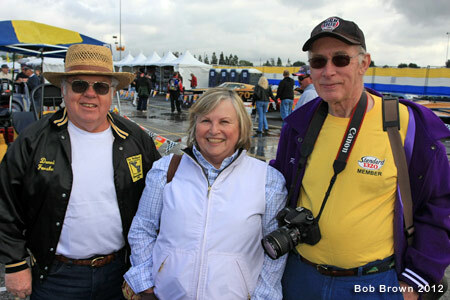 Bob Danly, Gwen McWilliams, Alex Brown and Gary Beck in the checker jacket. 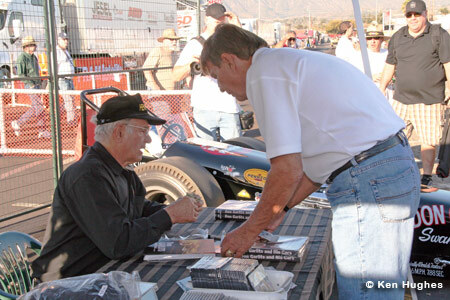 Danny Porche, Jim Walther, Marvin Graham, Jerry Ruth and Gary Beck to name a few. 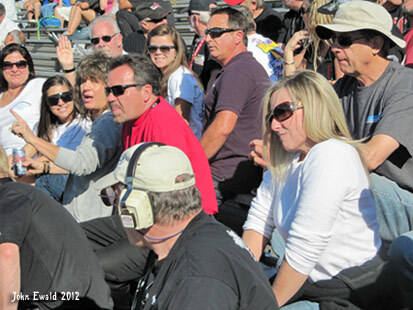 Big was up in the stands for every session. 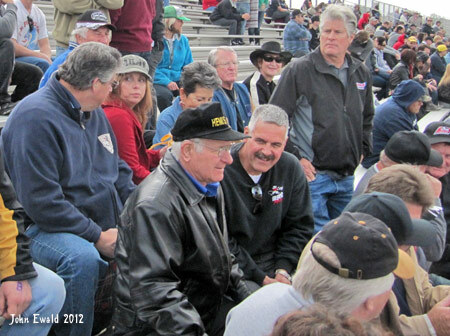 Says he now enjoys watching with his peers. 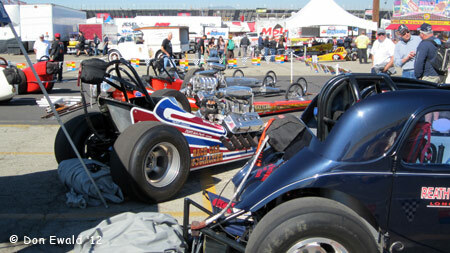 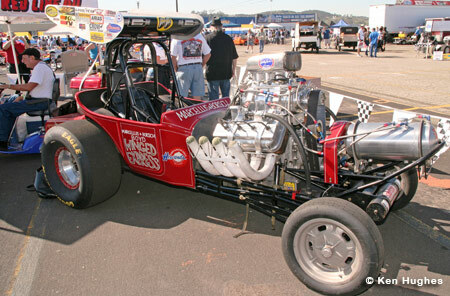 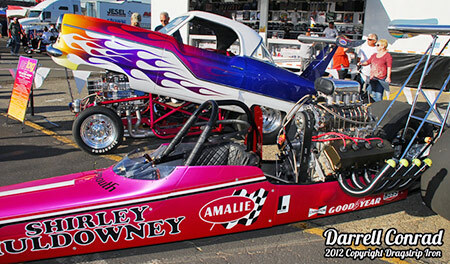 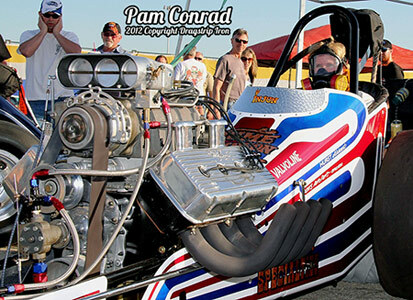 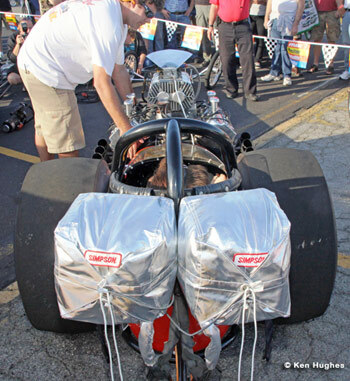 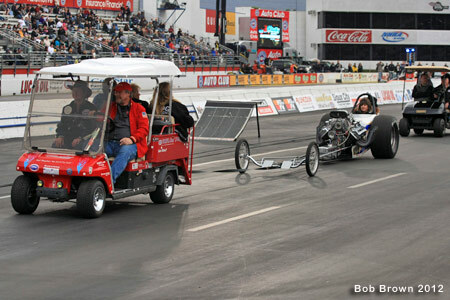 Danny and Amy Phee were at their first drag race courtesy of Gordy and Steve Gibbs. 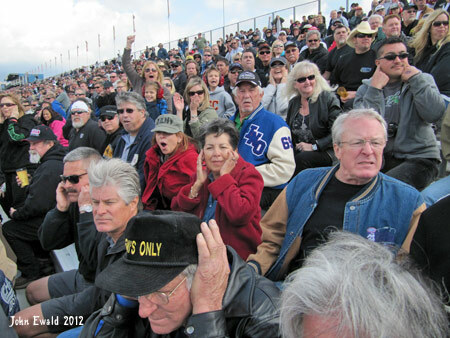 This could be the reactions to Jack Beckman's little trip into Densham's lane. 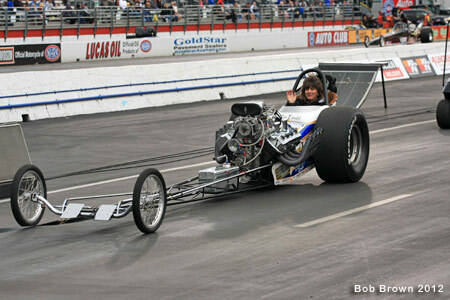 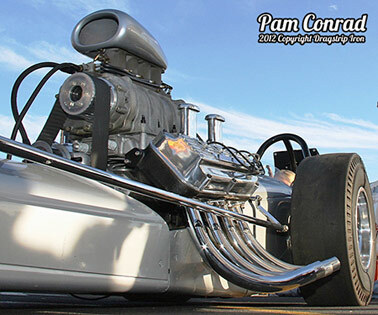 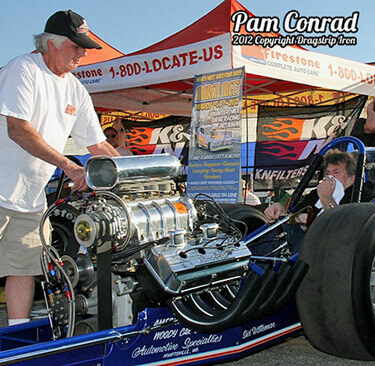 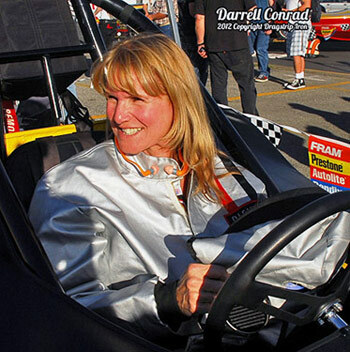 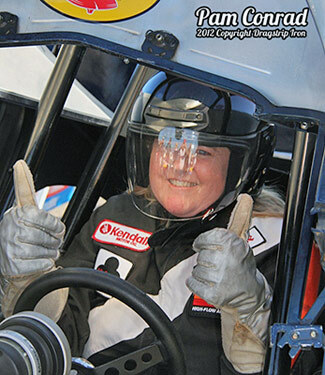 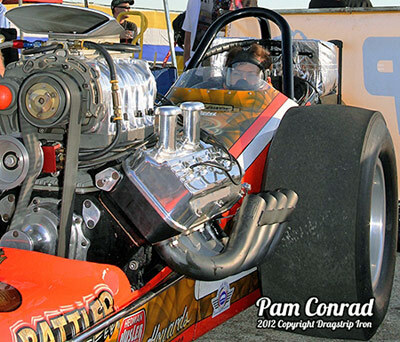 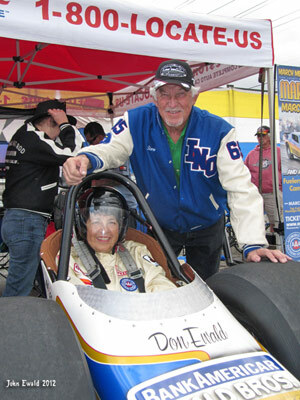 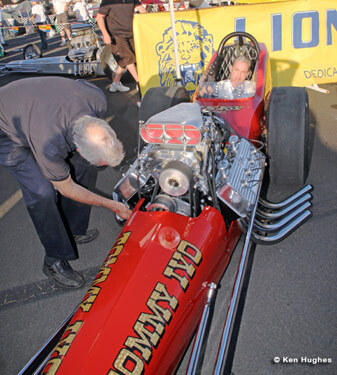 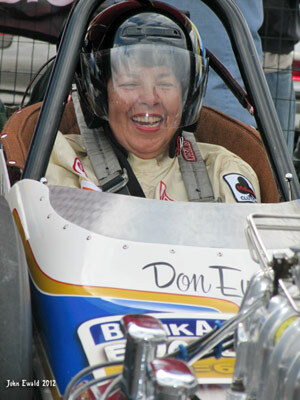 Although WDIFL photographer Bob Brown is a drag racing vet, this was his wife's (Christa) first drag race ever. 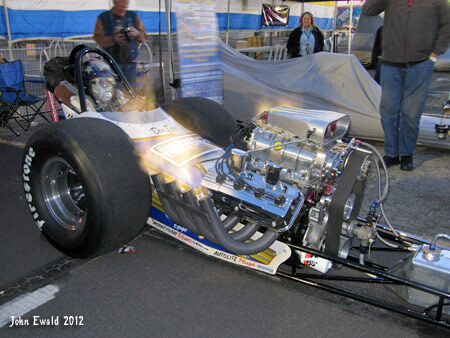 It was decided to break her in the right way.... with a fire up in the BankAmericar. 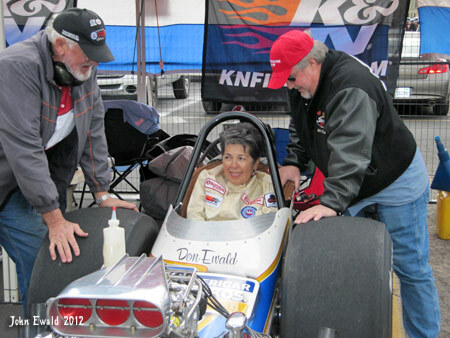 Here Bob Danly and John Ewald help her in. 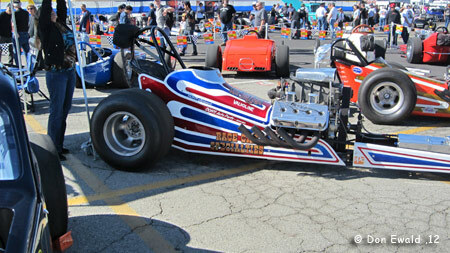 Bob Hirsch fired his Marvin Schwartz "Anaconda" over the weekend here with Gwin McWilliams inside. 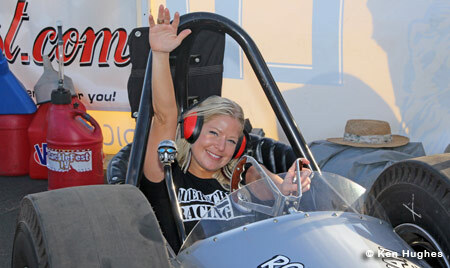 Christa's friend Gina Young, who has been to other drag races got the Mastercar fire-up. 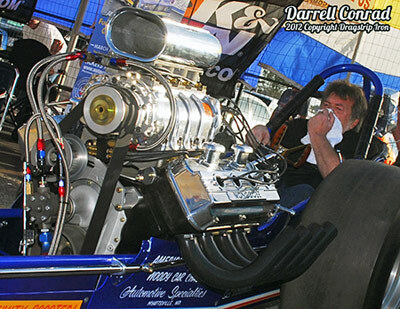 Mario Garcia gave her plenty of "whops". 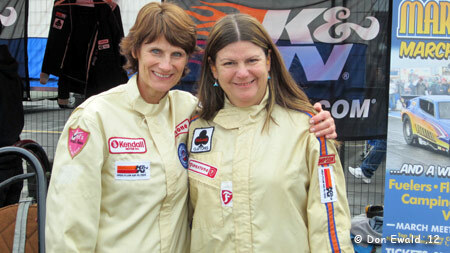 All in all it was an unforgetable day for the two nurses. 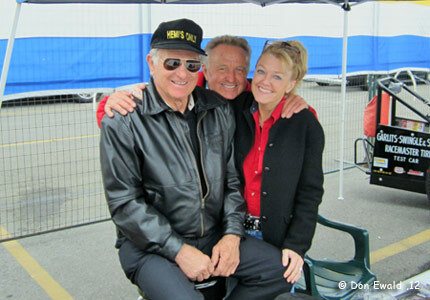 All smiles on Sunday after a very successful "Rat Roast" we have Don Garlits, Sonny Messner and Project 1320 founder, Traci Hrudka. 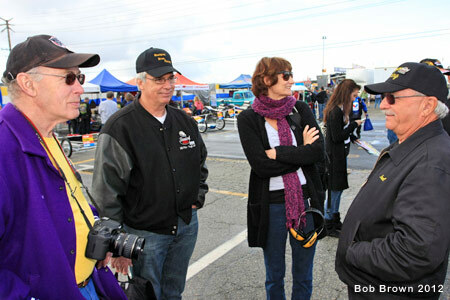 Roy Steffy, Bill Pitts, Christa Brown and Joel Gruzen. 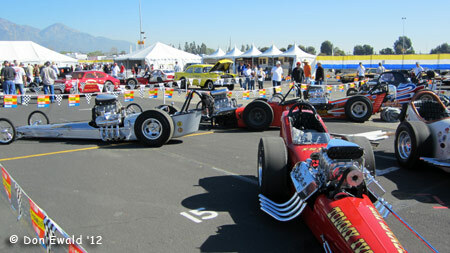 Sunday afternoon the cars started to load up for home. 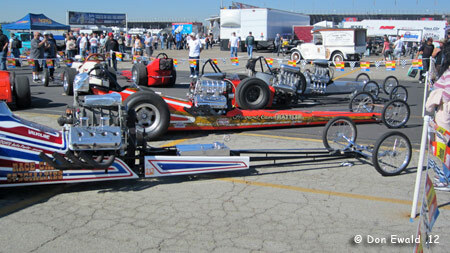 Richard Vasquez steers the ChiZler back to the trailer. 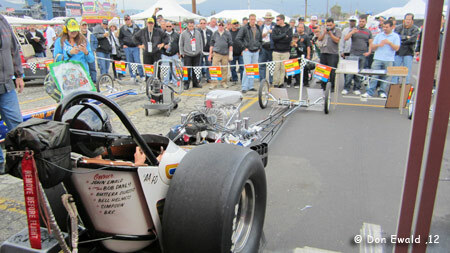 Jake McCloud and company heading the Dean Engineering car out. 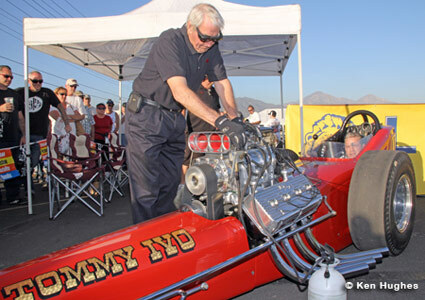 Bobby Hanson has his Wynn's Jammer strapped down. 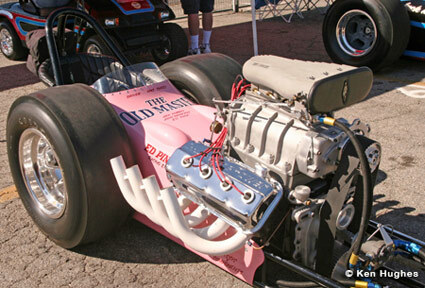 Pete Eastwood's "Ole Master" ready to leave. 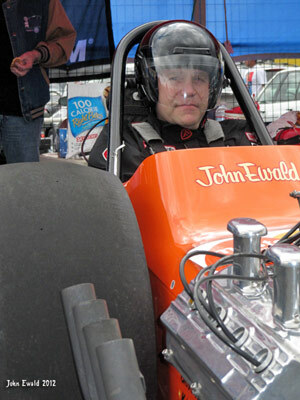 Jake Brown, a long time friend of John Ewald, got the last fire-up in the Mastercar on Sunday. 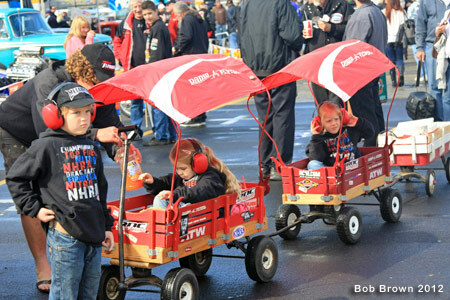 Between the semis and final rounds there was a mini cacklecar parade led by Lee Buttera Capps in the last FED her dad built. 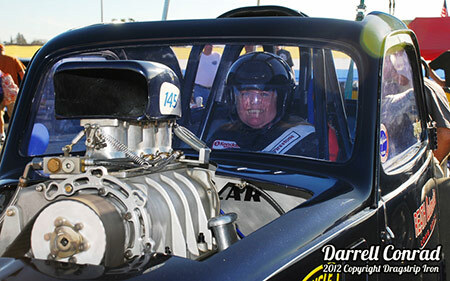 Mario Garcia in the Mastercar. 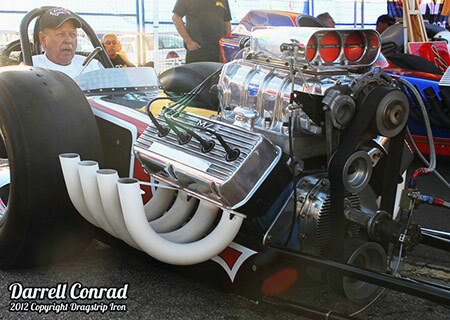 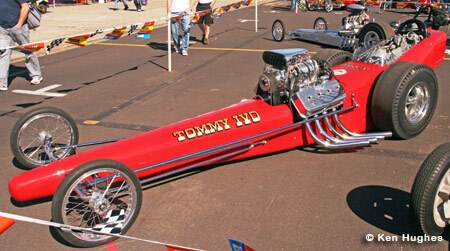 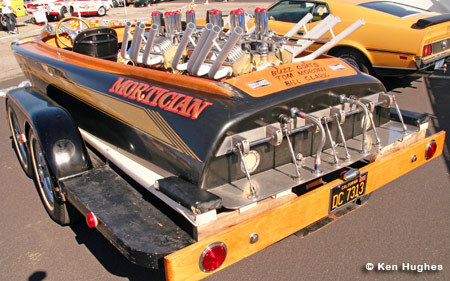 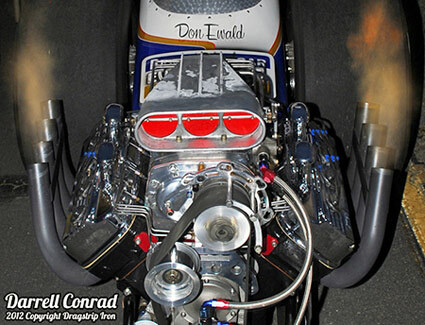 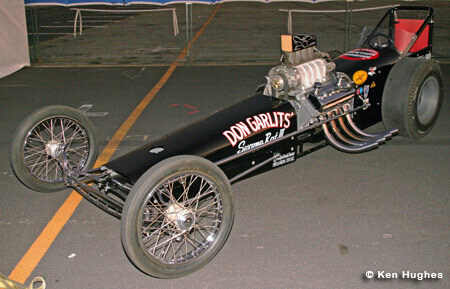 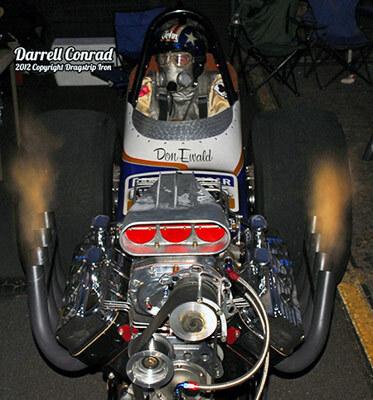 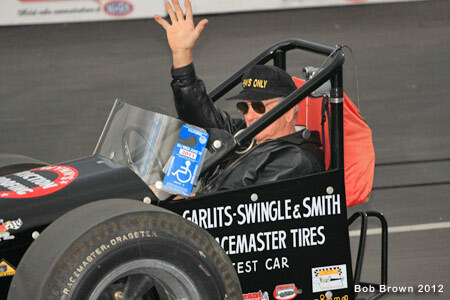 Sonny Messner pulled Don Garlits past this stands in his Swamp Rat III to acknowledge Big's 80th birthday.